Serbian is the language spoken in Serbia and by the Serbs who live in other parts of the former Yugoslavia. Due to its similarities to Croatian, the two languages used to be fused into Serbo-Croat, which was the official language of Yugoslavia until the break-up in the early 1990s. The user of this dictionary and phrasebook, however, will be clearly understood in Serbia and Montenegro as well as in most of Bosnia and Croatia. Included are a bilingual dictionary with more than 4000 entries, a concise grammar, and a comprehensive phrasebook for students, travellers and foreign aid workers. A commonsense pronunciation guide enables users to speak Serbian without learning the Cyrillic script. 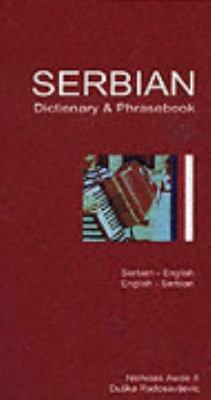 A brief history of the language and cultural information are also provided.Heaney, Duska Radosavljevic is the author of 'Serbian-English/English-Serbian Dictionary & Phrasebook Romanized', published 2004 under ISBN 9780781810494 and ISBN 0781810493. Loading marketplace prices 3 copies from $85.00 How does the rental process work?